Fat is ESSENTIAL for the proper functioning of the body. Fats provide essential fatty acids, which are not made by the body and must be obtained from food. The essential fatty acids are linoleic and linolenic acid. The body needs at least 15 grams of Essential Fatty Acids (Efra’s) per day, which can be obtained by eating fish, meats, seeds & nuts. I recommend the plant based sources. Each gram of fat contains 9 calories, twice as many as carbohydrates and protein, which is why so many folks become fat-phobic. But fat gets a bad rap. And this can make us fat! The fats you eat (all foods) should NOT EXCEED more than 30% of the total calorie intake per day and for optimal health, glowing skin and increase heart protection the majority of those fats should be both polyunsaturated fats and monounsaturated fats. AVOID saturated fats or trans fat. You should remember the low-fat craze from the 1990’s. It should also be called the high-sugar craze, because companies began selling “low fat” snacks packed full of sugar. The low-fat craze even made for a funny Seinfeld episode (the low-fat yogurt episode). But too many low-fat products made us overeat and gain belly fat. So eliminating all fat is NOT THE ANSWER. We even benefit from some saturated fat. Of course, if you have high cholesterol, you should talk to your doctor about going on a plant-based diet. But there are also healthy plant based sources of saturated fat, like coconut oil, that is good for you (as populations who eat a lot of coconut oil are often very healthy). Coconut oil contains medium chain fatty acids which are thought to contribute to its health benefits and to the fact that it does not seem to raise cholesterol levels. Plus, plants do not contain cholesterol (only animal products do) and that’s another reason why coconut oil does not raise cholesterol. The American Heart Association and other health experts recommend that you eat less than 300 milligrams of cholesterol daily. • The average American man eats about 360 milligrams of cholesterol daily. • The average American woman eats about 240 milligrams of cholesterol daily. Keep in mind while Coconut Oil is one of the highest of all Saturated fats; it comes from a plant source and not a meat source and is very healthy. What is a Monounsaturated Fat? Monounsaturated fats are also known as healthy fats because they lower “bad” cholesterol (LDL) and increase “good” cholesterol (HDL). Avocados, olive oil, and nuts such as almonds, walnuts, pecans and cashews all contain monounsaturated fats. NOTICE none of these are from an animal! So substitute olive oil for butter or eat an ounce of nuts as a snack. What is a Polyunsaturated Fat? You’ve probably heard the term “polyunsaturated fat” before, and this is another healthy fat. But unlike the monounsaturated fats, this version has more than one double-bonded (unsaturated) carbon in the molecule. You can find healthy polyunsaturated fat in many plant foods, such as grains, hemp seeds, sunflower oil, safflower oil, flax seeds, peanut butter, bananas, seeds, and nuts. But you can also find polyunsaturated fat in animals, such as fish. That’s where most folks get their heart-healthy “Omega-3” fatty acids. These fats help reduce cholesterol in your blood, lower your risk of heart disease, and may reduce inflammation in the body. If you drop fish oil from your diet, then you can simply replace it with flax oil. Hemp seeds are another substitute and a relatively new item on the shelves of health food stores. Hemp seeds contain the 3:1 ratio of omega 6 to omega 3 fatty acids that our body prefers. I definitely recommend adding hemp seeds in to your new healthy lifestyle. A quick side note – Hemp seeds contain 20 amino acids including the essential amino acids making it a complete protein. It’s hard to find a complete protein from a plant source so this is an easy no brainer protein source you can feel good about. Listed on the chart below are some fats broken down by saturated fats, polyunsaturated fats and monounsaturated fats to show you the degree that fats play in our lives. If you stick to the Easy Veggie Meal Plans, you’ll keep your trans-fat intake to zero, exactly what it should be. If you don’t already know, trans fats are deadly man-made fats added to all kinds of refined foods in order to prolong the shelf life of the product and make them addictive. They make you fat and cause heart disease. There is NO safe limit for this ingredient, so get it out of your life completely. But you’ll need to read the ingredient list to know if a product contains hydrogenated fats/ trans fats. Always look for any type of hydrogenated oil. If the food contains that, do NOT buy it even if the label says “trans fat free”. WHY? Because the sneaky government regulations allow a food to claim it is trans-fat free if it contains less than 0.5 grams of trans fat per serving. So beware, because so many foods contain hydrogenated oils like candy bars, potato chips, tortilla chips, cookies, cakes, crackers, peanut butter, granola bars, and even cereal. Eliminate trans fats and restrict your saturated fat intake to plant sources, such as coconut oil. 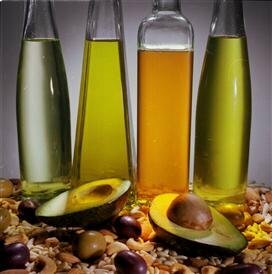 You can also get healthy unsaturated fats from nuts, avocado, and seeds, just don’t overdo it. Thanks, I try to keep it simple. I have a question: Flax seeds (ground or whole) and Flax seed oil – is one better than the other? Flax seeds have more fiber, lignan, some protein, and vit. and minerals. Overall flax seeds contain more nutrients. The flax seed oil is helpful if your diet is lacking in essential Omega 3′s and you need to boost your intake. Make sure it’s cold pressed flax seed oil. Overall- both are great for you.